If you are a registered member of the Aston Martin Owners Club (the AMOC) you receive a few magazines each year. 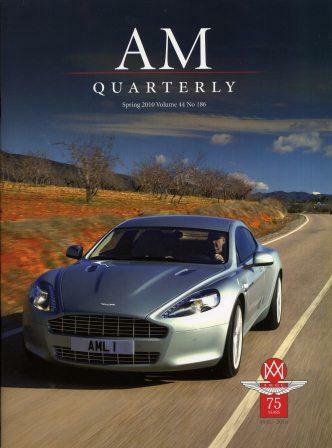 and finally “Aston Martin Quarterly” (AMQ) the glossy coffee table style magazine. Published four times per year, it contains technical articles, historical items, factory news and reports of Club activity from around the world. The Quarterly is a full color publication of, on average, 80 pages. Back in December 2016 I suggested to AMQ the idea of putting in a series of articles about information on the Internet about Aston Martins. My experience so far with this blog (and others like it on the Internet) is that once the owners ‘discover it’ they are very grateful that the resources exist. Maybe AMQ would be willing to help get the word out pointing at some of these sites. They were interested and after some discussion I submitted an article for consideration. The article describes my hope that other like minded owners take to the new technology and create or contribute to online resources to be shared with all. Something beyond the often disjointed and un-vetted information presented in the old ‘discussion forums’ format at sites like 6SpeedOnline and Pistonheads. [Those sites are great in their own right, but I am looking for a higher level] In the article I propose creating websites (like this) dedicated to each model and allowing multiple authors to contribute tidbits of knowledge, hopefully combining to be a great master online resource for each car. Imagine if you could go to www.AstonMartinDB9.info and find everything you need to know about the DB9. Starting in the spring edition of this year AMQ now has a regular feature called “Astons on the Web” written by yours truly. I’m feeling pretty proud to be part of this, and for them to give me the opportunity. I’ve gotten some feedback that the article went out in print late May, but as luck would have it the United States Postal Service managed to lose my copy in transit, so I’ve not seen the actual article in print myself. If you’ve read it, please let me know what you think about it by leaving a comment for me here, or by emailing AstonsOnTheWeb@amoc.org. If you are interested in reading the article, I have posted a copy of the pre-press edit here. If you have found other online Internet resources about ANYTHING interesting dedicated to Aston Martin, PLEASE leave me a comment here. The Internet is a very large place, and I am always looking for new article ideas. Tell me what you’ve found. As far as I can tell you cannot get AMQ online. I found that you can order some of the back issues from the Aston Martin Heritage Trust Online store, but they don’t appear to be keeping that current as the last edition available is from 2010. You can purchase a very nice ‘binder’ to hold your past editions from AMOC here. If you’d like to receive a copy of the Aston Martin Quarterly, all you need to do is sign up with the Aston Martin Owners Club. You can do this online from their website here. Membership isn’t that expensive (about $150 USD per year) and you don’t even need to own an Aston to join, you just need to be an enthusiast of the marque. Now I’m just going to head out to my mailbox and see if that Spring edition arrived yet…. Hi Steve, many congrats on getting to write for the AMQ . Well done..
Love the top 5 you did, couldn’t agree more. These cars truly are wonderful pieces of design and engineering. BTW, Aston Martin Racing won their class at the 24 hours of Le Mans today. Congrats to all at Aston Martin. Steve, I was worried….it’s been too long and I was having withdrawal! Thanks for the update. No worries. I aplogogize for not putting many articles out recently, it was deliberate to leave the True Costs and Battery videos out front and center for new users arriving due to the AMQ publication. I wanted them to find something more universally appealing to all Aston owners. Replacing a PCV valve may not have held their attention. I have a bunch of new ones queued up and will start rolling them out in the weeks ahead. Thanks for reading! I was reading intently your article about replacing the coil packs and the article just stopped mid-sentence. Am I missing something or is more to follow later? If so , when? from what I’ve seen you do great work and your stuff is very informative. I’m a past Ferrari owner, contemplating a newer DB9 (2011 & up). It has links to the prelim article on Lumpy Idle, plus all the steps to tackle the work. A 2011 should be in really good shape, so hopefully this won’t be a burden you have to carry. Thank you again for all the great work you’ve done to share your experience with keeping our DB9s in good running order. I’m looking forward to seeing your articles on everything related to brakes. I’m planning to replace all the brake pads soon to eliminate the squealing once I’ve read a few good articles to help me out. Up to now I’ve always just given my brakes a good blast from the garden hose before taking the car out, which has worked pretty well, but I’d still like to make a more permanent fix. Your DB9 looks Fantastic btw…still the best color Aston ever offered! Hi Chris. I will probably be doing the brakes/tires articles sometime in November. A few quick tips: You have to replace the caliper bolts every time (no exceptions). They are Torque to yield, so one time use only. Be sure to get new ones ($8 ea). Only needed if you are removing calipers to change the rotors. Regarding brake pads, the factor pads are expensive, make a ton of dust, but tend NOT to squeal. I use RS4 pads from Porterfield (you can buy online), cost much less, much less dust and I have rarely heard a squeal. There are pads available on Amazon from EBC brakes, and EBC reds cost even less than Porterfields, but I have heard they can squeal more. In all cases, you REALLY need to follow the official Aston pad bedding in procedure (it really does matter). You might try that now with your existing pads and rotors, it could cure the woes. Stay tuned…..